CEUTA, Spain, Jun 3 2015 (IPS) - A few kilometres before the border between the Spanish enclave of Ceuta and Morocco, a sign informs passers-by that this outpost of Spain on African soil stands in a privileged position for those who wish to observe the annual migration of birds across the Strait of Gibraltar, their shortest route from Africa to Europe. 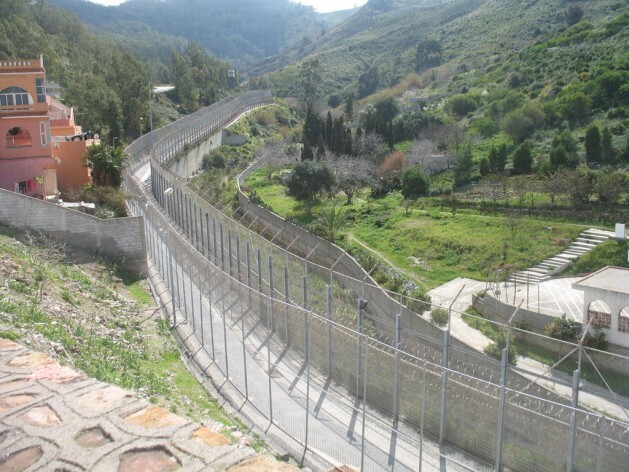 At the border itself, huge fences have been erected to block the daily attempts of human migrants seeking to escape hunger, despair and often conflict, a phenomenon that the people of Ceuta are less proud to advertise and about which they prefer silence. That silence was dramatically broken at the beginning of May when a border control X-ray machine detected Abou, an eight-year-old boy from Cote d’Ivoire, inside a suitcase being carried into the Spanish enclave. That was only the most recent of a number of (more or less ingenious) strategies used by migrants amassed in the Moroccan woods next to the Spanish border to try to enter the so-called ‘Fortress Europe’. Ceuta is one of the main (and few) ‘doors’ leading from northern Africa to the territory of the European Union, and is a ’door’ that has been closed since the end of the 1990s, when the Spanish authorities started to build two six-metre fences topped with barbed wire – complete with watch posts and a road running between them to accommodate police patrols in case of need – that surrounds the whole enclave (as in the other Spanish enclave in Africa of Melilla). Even if they do not catch the attention of the media as in the case of Abou, every day Ceuta is the scene of young African migrants, almost all aged between 15 and 30, trying to reach Spanish territory in ways that are as, if not more, dangerous than the one chosen by Abou’s father. The vast majority of them attempt to do so by sea, mainly in dinghies or hidden under the inflatable boats usually used by children on the beach. In February 2014, 15 Africans died trying to swim around the fence, when border guards fired rubber bullets at them in the water. Others attempt the border crossing hidden in secret compartments under cars, and some even try scaling the fences. What strikes the visitor most about Ceuta is its incredible contradictions. The city, with its population of just over 80,000 people living in 18.6 square kilometres and proudly Spanish since 1668, gives the idea of wanting to live as if the migrants and their attempts to reach the enclave do not exist. On one of the days that Abou was capturing the headlines of media around the world, the main news reported on the website of one of the enclave’s two newspapers was the results of an opinion poll on upcoming administrative elections. The “Centre for Temporal Stay of Immigrants”, where all migrants that manage to enter the enclave are accommodated, is an enormous structure which is incredibly hidden and impossible to be seen from any point in the city and from the hills behind it. Spanish radar works silently and ceaselessly from the top of Mount Hacho overlooking Ceuta, identifying migrants trying to reach the enclave, but many of the inhabitants of the area will tell you that they have never seen the enormous fences that stand in the middle of the hills just four or five kilometres away from the city centre. The enclave, described by the Lonely Planet travel guide as looking like a “grand social experiment concocted by rival political systems” and a sort of “cultural island”, is unique from a demographical point of view in that 50 percent of the population is Moroccan or of Moroccan origin. The city is divided into a sort of well-established and quite rigid “caste system”. The first and richest group is that of the Spanish, generally very conservative, very religious and devoted to traditions. The Popular Party has governed the city for decades and mostly opposes any change in the status quo – thus, for example, the Arabic language is not taught in schools. The second group is that of the “Moroccan Ceutans”, sometimes Spanish citizens with Moroccan origin, in other cases Moroccan citizens with regular residence and work permits. Many of them have adopted the Spanish lifestyle and speak Spanish better than Moroccan Arabic but most of them respecting the religious precepts of their fathers. Some of these “Moroccan Ceutans” have accumulated huge amounts of money thanks to the flourishing illegal smuggling of goods across the border and live in the most elegant and beautiful houses of the city, while others – many others – live in the degraded district of El Principe, where friction with the Spanish population is sometimes serious. This latter sub-group contains a small but significant number of stateless children, born in the Spanish enclave of Moroccan parents who, mainly as a consequence of expiry of their residence permits having left them in an illegal position in Spanish territory, have never had the possibility to register the births of their children in Morocco. None of these children have access to school, even if Spanish law has established the right to education for all the children in Spanish territory, irrespective of their nationality or legal position. The third group is that of the so-called transfronterizos, Moroccan citizens residing mainly in the nearby Moroccan village of Fnideq who cross the border every day to work in the enclave city or, more often, to buy and sell goods in the black market. They can be seen every day in the Poligono area next to the border post, carrying enormous packs of goods on their shoulders to be sold on the other side of the border. Police on both sides observe this continuous movement of people in silence – under an agreement signed by the Moroccan and Spanish governments in the 1960s, goods that a person is able to carry on the shoulders are exempt from customs duties. A fourth group is that of the “black people”, the “caste” that the city tries to ignore and hide, not considering that they are the source of its major wealth – the funds that are assigned to the local authorities by the Spanish state and the European Union every year – and that their presence in fact provides many jobs in the public and security sectors. Ceuta has always been and continues to be above all a military outpost. The number of police, guardia civil and soldiers patrolling or simply passing through the few roads of the enclave is impressive, as is the number of military training exercises that take place in the enclave, but just a few hundred meters beyond the border post and the Poligono is what appears to be part of another world. The tiny village of Benzù sums up the contradictions of the whole enclave. Situated at the end of the beautiful coastal road in the western part of the enclave, it is the last Spanish establishment before the northern frontier post, and has been closed to the passage of people for many years. With its beautiful sea and coloured houses facing the Spanish coast on the other side of the Strait of Gibraltar, the village would not be out of place on a Greek holiday island. However, two hundred metres beyond the village, the presence of the last pillars of Ceuta’s border fences contaminate the crystalline water of the bay of Beliones. The sea is discretely but constantly patrolled by the rubber boats of the army and police of both Spain and Morocco. The distance between the last Spanish houses and the first houses of the Moroccan village of Beliones is only of a few metres, divided by the iron and steel of the two fences covered with the barbed wire. You bump into them walking along the small road of the village, between a bakery and a small shop. Nobody is outside, the silence all around is deafening. Groups of midges cross the border undisturbed without having to show passports to the border authorities. Three metres beyond, the beginning of another country, another time zone, another culture. Looming over the landscape is Jebel Musa, the so-called Mujer Muerta (Dead Woman), a spectacular rocky mountain constantly covered by clouds that are constantly scurrying as if to compensate the slowness of the human movements blocked by the fences. Here, the spectre of death, the death that many people have met trying to cross this border, lingers even in the name of the mountain. The Moroccan woods behind the village of Beliones are populated by groups of monkeys which, before construction of the border fences, periodically reached the hills of the Spanish enclave. A small group of monkeys still lives, however, in Ceuta’s “San Amaro” park not far from the city centre – closed in a cage. Good article – and it’s not just migrating birds; a couple of thousand years ago, the Romans were placing sentries on top of Jebel Musa to watch out for migrating schools of fish, coming in and out of the Med, and although no-one bothers to watch any more, those migrations still take place – and Ceuta is still one of the best places for fish in Spain (if that makes sense)!